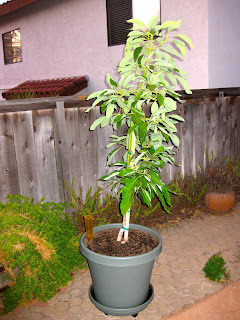 It was just over a year ago that we brought an avocado tree home from Lowe's. While it has yet to produce fruit, the little guy's grown quite a bit and isn't all that little anymore. In fact, despite losing almost all it's leaves early in the summer, we've now had to transplant it twice. Since we had an extra pot, and a little bit of extra cash, we sprung for a new addition to our patio garden this past weekend. 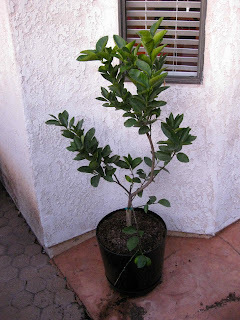 Living in SD county, how can we not have a citrus tree? 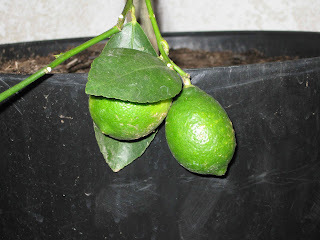 This one is a lime - as evidenced by the pair hanging off a branch. Hopefully we'll be enjoying the (literal) fruits of our labor within the next year.